Final fixture of the season and all HAC endurance athletes are expected to be involved and be part of the team! All is still to run for and a few of our teams still have promotions in their grasp so drop the shopping trip, put the injury on ice, shirk your work, shun parkrun and get covered in all shades of mud at Wormwood Scrubs. Fixture details here http://www.metleague.co.uk/fixtures.html Just turn up in good time and find the HAC gang. There is also a Curry Night afterwards at the clubhouse. The list to register for food is at the clubhouse. A total of 18 Hillingdon AC members braved the testing conditions at the South of England Cross Country Championships at Stanmer Park near Brighton on 24 January. On a brutally hilly course and racing over five miles, Hannah Wells 88th and Zoe Dobbs 232nd represented Hillingdon AC in the Senior Women’s race, Dominic Speight was the club’s sole representative in the five mile Under 20 Men’s race finishing 102nd, while there were 15 Senior Men from the club competing over the demanding nine mile course. James Laing was first finisher for the club in the men’s race in 93rd position with the scoring six completed by Dan Thompson 123rd, Ed Campbell 160th, Martin Bateman 209th, Simon Connell 261st and Philip Warburton 375th. The Senior Men’s team finished 22nd out of the 55 clubs that finished six or more scorers. Hillingdon AC’s representation was completed by Paul Leppard 455th, Gary Horn 501st, Andrew Malyan 610th, Dave Smith 632nd, Stevan Dokic 697th, Trevor Steeples 784th, Bob Burton 798th, Jeremy Collis 804th, and John Luscombe 831st. There were 855 finishers. In addition, the athletes were well supported in their efforts by amongst others Harry Wild, Norma Cressy, Roy Cnudde, Gerry Archer, John Bignell, Martin Searle, Alan Wells, Richard Mann and Rob Thompson. Congratulations to everyone that competed – cross country running doesn’t get tougher than this! Photos of the race may be found here (use the race number from the race results to search for photos of different athletes). Congratulations to Andy Cox on becoming Middlesex County 10km walk champion and to the team who came 2nd in the Enfield League at the weekend. The Hillingdon Athletic Club Annual General Meeting will be held on Tuesday 10th March 2015 at 8.15pm. All members are invited to attend. If you wish to place an item on the agenda or make a resolution please notify the Club Secretary, Lynda Copson, by 10th February at the latest. All resolutions require a proposer and seconder. Elections for the following positions will be held at the AGM. If you wish to be nominated for any position please notify the Club Secretary by 10th February at the latest with details of your proposer and seconder. The Formal Notice for the AGM will be sent out week commencing February 23rd 2015. A current list of club fixtures can be viewed here. Marshals and volunteers are need for the F20 road race on Sunday 8th March at 9am. This is the clubs main fixture of the year. We need you, our club members to spare a few hours to ensure this event runs safely and smoothly. A marshals form & course map will be available at the clubhouse , please mark you name against the point where you would like to marshal. You can also contact Maria Hernandez-Humm, marshal co-ordinator via email at m.humm@sky.com or mobile on 07957 185631. Hillingdon AC’s Senior Men moved a step closer to securing sixth place in Division One of the Met League at the end of the season with an improved performance at the fourth race of the season at Horsenden Hill. Following a poor turnout at the previous league fixture at Uxbridge, the team was bolstered by the return of Rob Thompson, Sam Lloyd and Wes Godfrey to the A team scoring 12, helping the A team finish sixth on the day and sixth overall in the league with one fixture remaining. James Laing was first scorer for the club in 14th place and the A team was completed by Gary Horn in 188th place. The B team slipped out of the top two places in Division Three for the first time this season, finishing fifth on the day, the B team now sit fourth in Division Three after four fixtures. However, the B team still have a chance of promotion to Division Two if there is a strong team performance at the final Met League fixture at Wormwood Scrubs on 07 February. Paul Leppard was first scorer for the B team in 205th place, while the B team performance was boosted by season’s debuts for Brett Hutchinson and Steve O’Keefe. Jason Steel was the final B team scorer in 290th place. In total, Hillingdon AC had 33 senior men competing in this fixture from a field of 389. 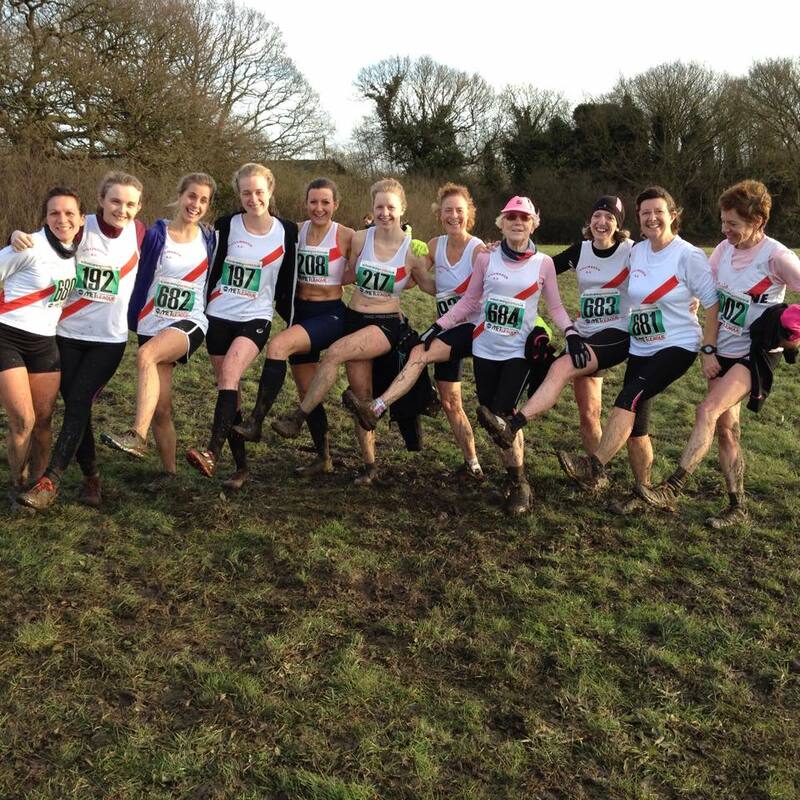 The XC season continues and each fixture is muddier than the last reports Donna Nash! Our ladies put in another sterling performance with our first 5 scorers achieving 2nd place behind Barnet & District AC. We remain 3rd overall in division 2 of the league out of 10 teams. 11 ladies competed for Hillingdon on the day and it was fantastic to reach double figures again for a Met League fixture. Steph was first home for Hillingdon inside the top twenty (19th / 25.09) and had plenty to smile about; Hannah Wells achieved her best Met League position so far this season coming in 26th (25.38) and just under half a minute behind Steph. After Hannah came Morgane (73rd / 28.51) sporting her new snug-fit vest (c’est tres jolie)! Next two home were two new team members completing their first cross country and who are already impressing coaches and fellow club members; Ciara Williams (78th / 29.02) and Kate Shockley (80th / 29.04) – extremely close and exciting finishing. Ciara had already completed parkrun earlier in the day. Zoe Dobbs was our 6th scorer placing 100 (30.20) and exactly the same finish as Uxbridge – talk about consistent! Next target for Zoe is to come inside the 100. Pauline Fischer continues to run well and finished 120th ; followed by Melanie Spencer, 124th who wins the (pretend) prize for the muddiest rear end (and that was BEFORE the race – well it was rather slippery underfoot!! ); Lucy Duncan arrived home 146th and put in her first appearance this season – was lovely to have her back on the start line; Jackie O’Dowd finished 159th completing her 2nd cross country and last but by no means least was the amazing Angela Duncan, looking pretty in pink, finished 163rd and came 1st in her age category! Thank you to everyone who competed – your efforts are greatly appreciated. Next Met League – Saturday 7th February – Wormwood Scrubs.